Sarri snubbed Pep Guardiola’s handshake as the final whistle blew on Chelsea’s biggest defeat since crashing 7-0 to Nottingham Forest in 1991. And the Italian accepts he could now face the sack. “It is right,” he said. “I am in charge of the team so it is right. My job is always at risk. Guardiola was “proud” of his team after emerging from three matches in eight days – against Arsenal, Everton and Chelsea – with nine points and a foothold at the top of the table. But he admitted that Manchester United now have a huge say in the destination of the Premier League title with Liverpool set to play their game in hand at Old Trafford on February 24. “We are top of the league but we have to wait to see when Liverpool go to Old Trafford now as we have played one more game,” he said. “They win that and they are leaders, with us behind. But I am proud of my players. “We have to go game by game and with 11 games left we are going to try until the end to retain the title. But we are there and that’s what I’m proud of. Chelsea defender Cezar Azpilicueta described the performance as “unacceptable” and apologised to the club’s fans. More worryingly he hinted that it is not a united side. 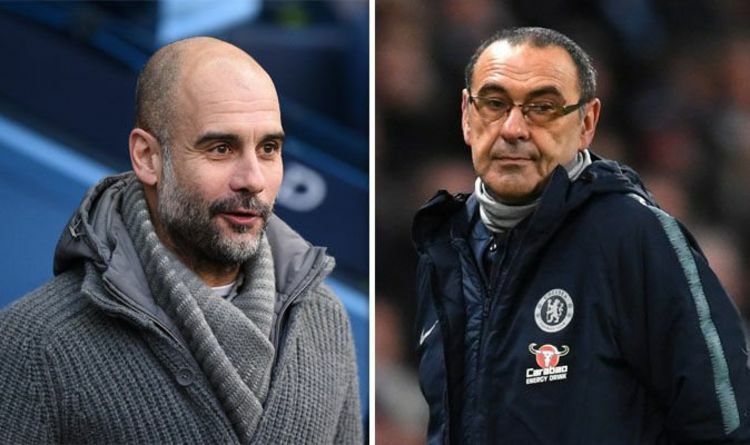 Guardiola offered his support for Sarri insisting he did not have a problem with the Italian despite the lack of a handshake after the game. “I know what he wants to do,” he said. “They beat us at Stamford Bridge and against Napoli last season it was tight, they were better at moments.